12/10/09 – I’m editing this post and putting up a new video, because I’ve now had a few months to play with my paper mache clay recipe. The new video will give you instructions that you’ll need to make sure your toilet paper rolls contain the same amount of paper as mine. The new mixing instructions are also easier to use. This recipe was inspired by Ronnie Burkett’s Papier Mache Rediscovered (recipe #2) and some comments by readers, especially Bob’s comments on the paper mache pumkin post. Thanks, everyone. Note: This material does use items from the hardware store that are not rated for use by children, and the resulting clay is not edible. Small children should not use this clay. 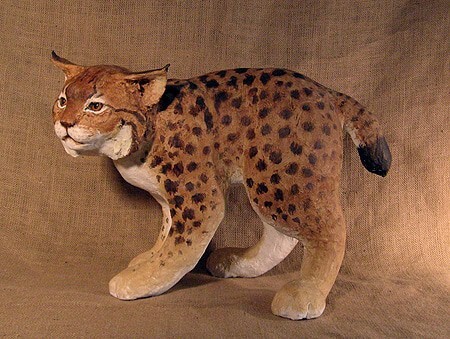 I used this clay to make all the big cats you can see on my gallery page. Edit – 11/3/09. While you can speed up drying by putting your sculpture in a warm oven, I don’t recommend using a temperature higher than 150. The heating clay puts out some fumes if you go higher than that. I’m not a chemist or a doctor, but it doesn’t seem like something you’d want to breath for very long. Also, any masking tape that is still exposed will unstick itself in the oven, even at a low temperature. I recommend that you be patient and allow your clay to air-dry naturally. Hi Jonni. I was wondering how long do you need to let an amateurs 1st layer of PMC dry before adding another layer? Thank you! Hi Lisa. It depends on how thick your layer is and how humid and warm your weather happens to be. In other words, it really depends. I always give mine at least two days to dry, and I use layers that are about 1/8″ or less. If you put your sculpture in front of a fan it really helps speed up the drying time. Thank you Jonni for the information. I’m going to try to attach a picture of my snowman that I used the PMC on. Did you try to upload a photo with your comment? If you did, it didn’t work – probably because it was too large. Try editing the image to make the file size smaller and try again – we’d love to see it. I dont have “join compound” but i have all kinds of caulk like sealant, liquid nails, etc. Will any of that stuff work instead? I haven’t tried any of those things, but I doubt it. Joint compound isn’t like any of those things – it’s made for a different purpose with completely different ingredients. You can go ahead and try it, of course. Dianne, we would love to see your Fairy Tree. Do you have a photo you’d like to share? And as soon as you get that dragon finished we want to see that, too! Is there a way to make the clay with a non-toxic substitute for the joint compound? No, this recipe really needs the joint compound, but as far as I know, it is really only toxic if you sand it and forget to wear a mask. The dust isn’t good for your lungs. But if you want a recipe that doesn’t have the joint compound, do a Google search for paper mache pulp. It won’t be as smooth or quite as easy to work with, but it’s just paper and paste – all organic. Also, check out this website for recipes and tutorials. Hi Jamie. I haven’t used plaster cloth on top, but I have used plaster cloth under paper mache clay. I’ve only done that when I wanted a sculpture to be hollow – the plaster cloth is much easier to cut apart when it’s time to remove the armature, and then you can stick it back together. Is there anything under the ribs in addition to the wire mesh? Do you have a photo you could share so we can get a better idea how your project is built? I saw somewhere where you said one could substitute glycerin for boiled linseed oil. Have you tried this? Does it work/last as well? Thank you! I’m glad it worked for you. I hope you’ll post a photo when it’s done – I’d really like to see how it comes out. Great information. Can paper clay get wet once it’s dry, and how quickly does it burn? Thanks. Paper mache needs to be treated like traditional paper mache, so you can’t let it get wet. It won’t melt, the way wet paper mache does, but it gets soft and will probably collect mold. I haven’t tried burning it, so I can’t answer that question at all. I doubt that it will burn very well, but I could be wrong. Do you have some unusual use for the clay? An interesting project that you have in mind? I have tried to burn the clay, accidentally… It doesn’t burn… It becomes soft from the glue. Thanks, James. Good to know. I hope that accident didn’t burn anything else, either.